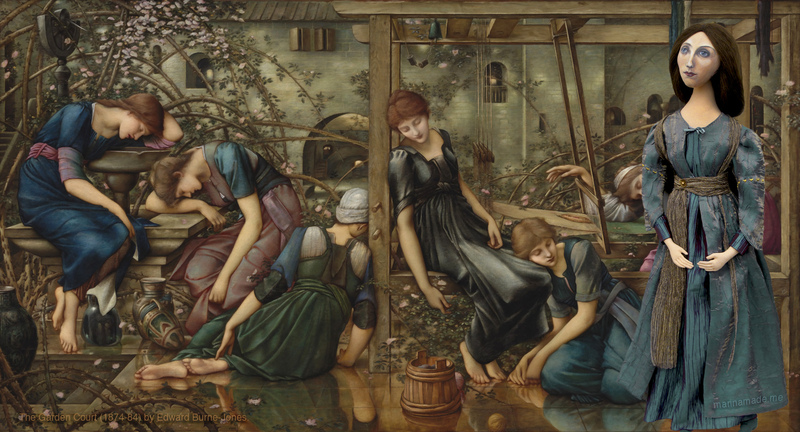 I knew little about Georgiana Burne-Jones before my research, but found her intriguing. Of the many elegant, ethereal women in her husband’s paintings, how often was her appearance visible ? It seems her beauty was an influence in Burne-Jones early work, yet as his skill increased he developed his own distinctive style of an ‘idealised woman’ easily recognisable as his, but slightly lacking in her own identity. “The Golden Stairs” 1876-80 by Edward Burne-Jones. I chose Georgiana as one of my muses because like many women behind great artists, she was over overlooked and undervalued in her time. A promising artist and wood engraver herself, she had little support as a Victorian woman and any hope of pursuing her creativity ceased when she married and became a mother. Her role was to support her husband and care for their children, which she dutifully accomplished, however it was a considerable disappointment to her that she had to sacrifice her talent. Only in her later years was she able to find fulfilment and achievement. Edward Burne-Jones’ hauntingly beautiful portrait of his wife Georgiana, and with their two children Margaret and Philip in the background, was begun in 1883 and then worked on at intervals. It was not exhibited in his lifetime, presumably because it was considered as too personal for public display. Georgiana Macdonald was born in 1840, the fifth of eleven children of whom only eight survived.Known as Georgie she was the second eldest of 4 very talented and remarkable sisters, each one of them succeeding in marrying accomplished men and/or bearing gifted children. Both Georgiana’s father and grandfather were strict Methodist ministers, so her father George Macdonald and dutiful mother Hannah brought up their family following devout Wesleyan principles, but not in a “hellfire and brimstone” forbidding way. They were middle class by calling but without the comfortable income of that class. Moving home every three years for Revd George’s new ministerial posts meant a lot of packing, unpacking, patching carpets and making do. George was a very un-materialistic man, but he had a deep love and passion for books which he bought regularly on his travels. These books were readily accessible to the children and unusually for that time and that household, barely anything was censored. The children read everything from religious magazines to ‘The Pilgrim’s Progress’, Robin Hood and Grimm’s Fairy tales. Only Shakespeare was thought a little too near the knuckle and was forbidden. 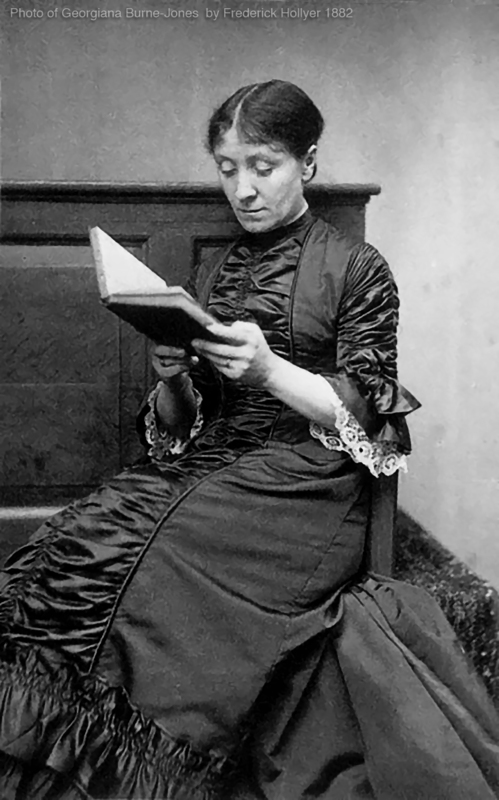 Like most early Victorian mothers, Hannah taught all her children at home during their early years. She took them to Chapel for their religious education from the age of three. The eldest boy, Harry was sent to the best school his parents could afford at the age of four, his younger brother Fred went to the local day school. The girls, being girls were mostly taught by their affectionate mother at home, with brief, intermittent periods of shared governesses with other children. 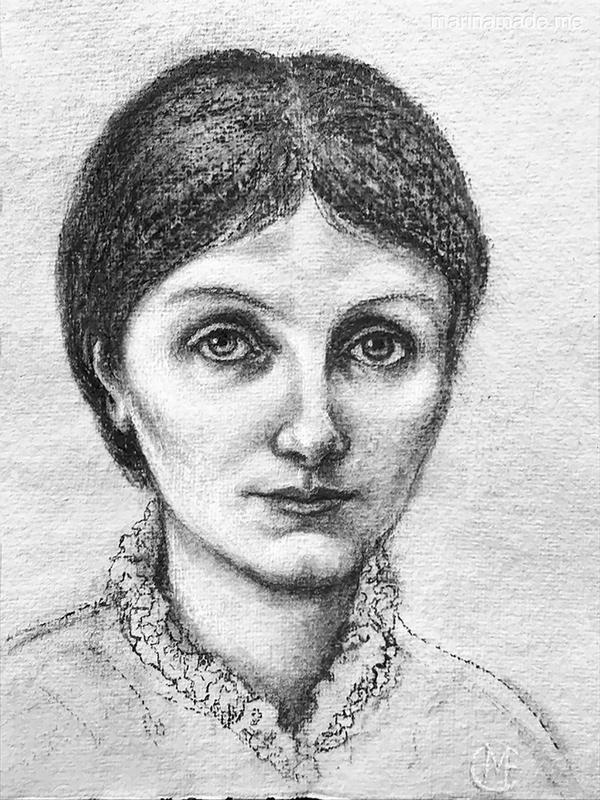 Limited in scope they received what was fundamentally a traditional education for girls of the time: reading, basic arithmetic, a little French or Italian, also the usual accomplishments of poetry, music, needlework and drawing. Unhindered the girls grew up to be bright, cultivated women showing flair in Literature, music and drawing as well as the practical domestic skills expected of young Victorian women, such as dress making, baking and housekeeping. The Macdonald Sisters. The images of Louisa, Georgiana and Agnes are from painted portraits by Edward Poynter, Agnes husband. Alice is by an unknown photographer. Alice, the eldest sister would later marry John Lockwood Kipling and be the mother of Rudyard Kipling; Georgiana (who we will hear more of ) would marry the artist Edward Burne-Jones, write his biography and become a political activist; Agnes was to marry the painter Edward Poynter, who would later become the president of The Royal Academy; and Louisa would marry iron master / businessman Alfred Baldwin and she would become the mother of Stanley Baldwin, the Conservative Prime minister. There was another sister named Edith, known as Edie who never married. She was the youngest and most undervalued member of the family, who cared for her elderly parents and was always available in a family crisis. Edward Burne-Jones as a young man. Photograph taken by David Wilkie Winfield, c 1860. Georgiana Burne-Jones portrayed by Dante Gabriel Rossetti 1860, the year she was married to Edward . Ned’s own mother Elizabeth Coley Jones died six days after his birth so he was raised by his grieving father and the housekeeper, he had no siblings. After Grammar school Edward Jones attended Exeter College Oxford to study theology. There he befriended fellow student for the clergy and poetry devotee, William Morris. Their interests were soon diverted from the Christian ministry to reading literature and looking at art. In the 1850s contemporary art was focused on the revival of medievalism, which included literature, architecture, decorative and fine arts. This was not an attempt to recreate the Middle Ages, but a new creation of an idealised, imaginary past to comment on the present day. This period was to be known as the first phase of ‘The Pre-Raphaelite Brotherhood’ (1848-1855), started in 1848 by John Everett Millais, William Holman Hunt, and Dante Gabriel Rossetti; ( the term “Brotherhood” came from Rossetti, imbued from childhood in ideas about secret societies, the Masons and Carbonari). The other founding members were James Collinson, Thomas Woolner, William Rossetti and F.G. Stephens, making a fraternity of seven . The creed of the group was: ‘To have Genuine ideas; Study nature and be true to it; Sympathise with what is direct and heart felt in previous art; Exclude what is conventional, self parading and learned by rote; Produce thoroughly good pictures and statues’. The subject matter favoured included: Medieval life and Christian Doctrine, scenes from contemporary life often expressing moral values, scenes from literature, notably Shakespeare, Tennyson and Keats. These subjects were not unique to the P.R.B but their style, models and their painting techniques were new. 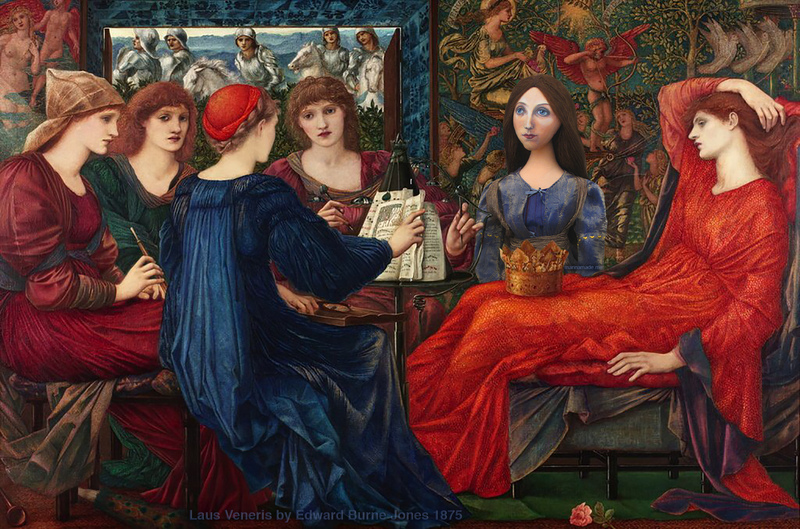 The Pre-Raphaelite Brotherhood were the first group of artists to see themselves as ‘avant-garde’, rebelling against the presiding art of the time. Passionate and articulate about their aims and methodology they laid out their anti-establishment manifesto in their magazine, “The Germ”. 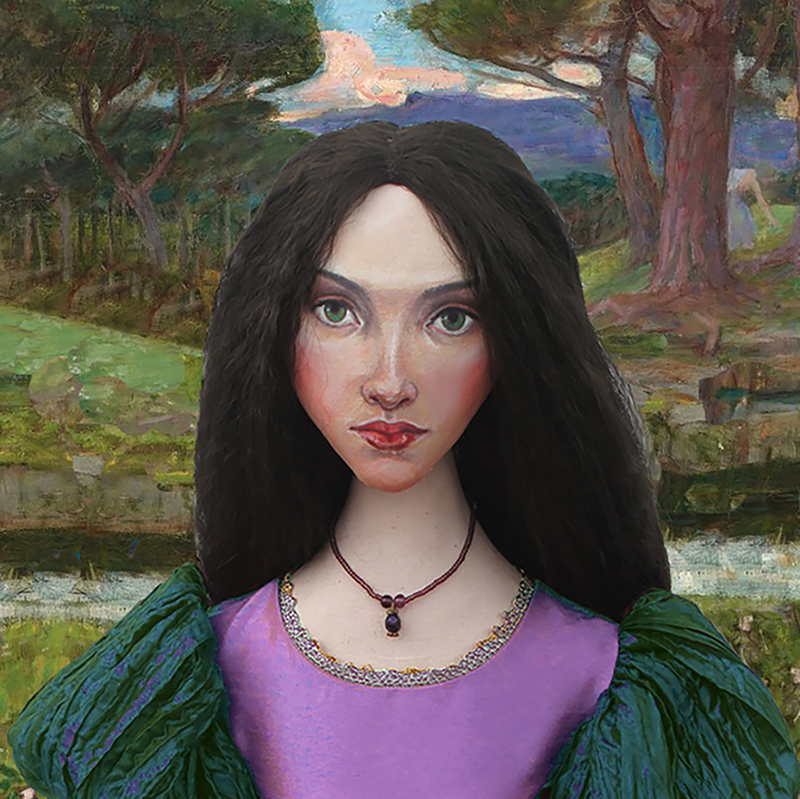 The Pre-Raphaelites painted in acute detail using intense glowing colours, with a romantic vision to outshine the drabness of Industrialised Britain and social disorder. D.G.Rossetti, Letters of Dante Gabriel Rossetti Oxford University Press,1965-7, vol 1, p. 192. “The knight’s Farewell”, an early pen and ink drawing by Edward Burne-Jones, 1858. Ned Jones didn’t complete his Divinity degree, he decided to move to London and become an artist. He took lodgings at Sloane Terrace, where he was content to live in poverty while he painted, encouraged by his hero Rossetti. In Ned’s early work the female figures were often based on preliminary studies of Georgiana and sometimes her sisters. Georgie had pensive almost melancholy beauty which Ned painted in a tender, ethereal manner, influencing much of his work. In 1853 Georgiana and her family moved to London and Georgie was able to attend The Government School of Design in South Kensington to study drawing and illustration ( the school was situated in the now V&A, which evolved into the Royal School of Art and eventually the Royal College of Art). It had long been Georgie’s ambition to become a wood engraver. Dead Bird, by Georgiana Macdonald, later Georgiana Burne-Jones. 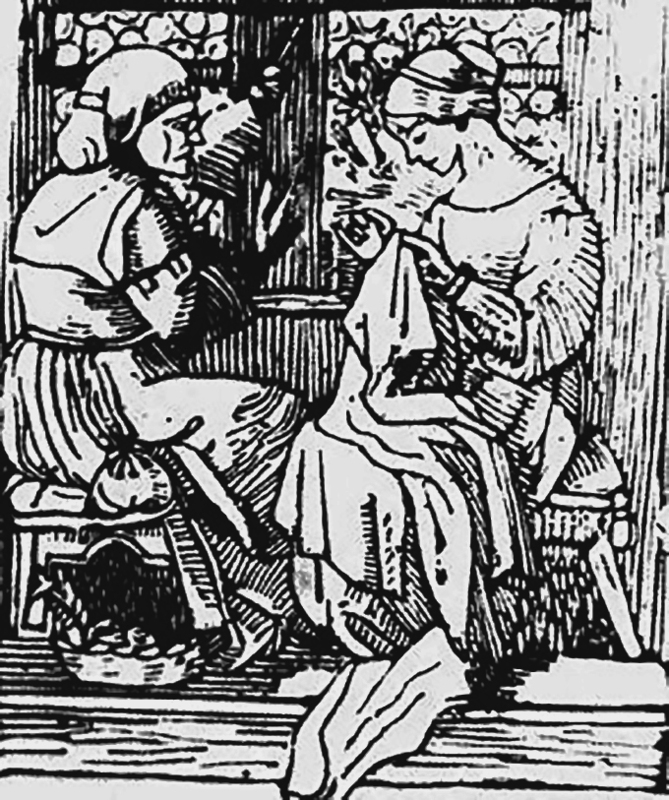 Woodcut by Georgiana Burne-Jones, nee Macdonald. Ned Jones would often meet Georgie on her way home, bringing her flowers and walking with her. The two became closer, Georgie was petite and had stunning blue eyes and beautiful brown/ bronze hair; Ned was tall and fair emphasising her tiny frame, their attraction was deep but unspoken, he awoke in her a new world of art, poetry and love. In 1856 Ned sought the approval of the Revd Macdonald for he and Georgiana to become engaged, she was just fifteen. However it would not be until 1860 until Jones would be able to support his young betrothed, but by now it was obvious their engagement would be permanent. 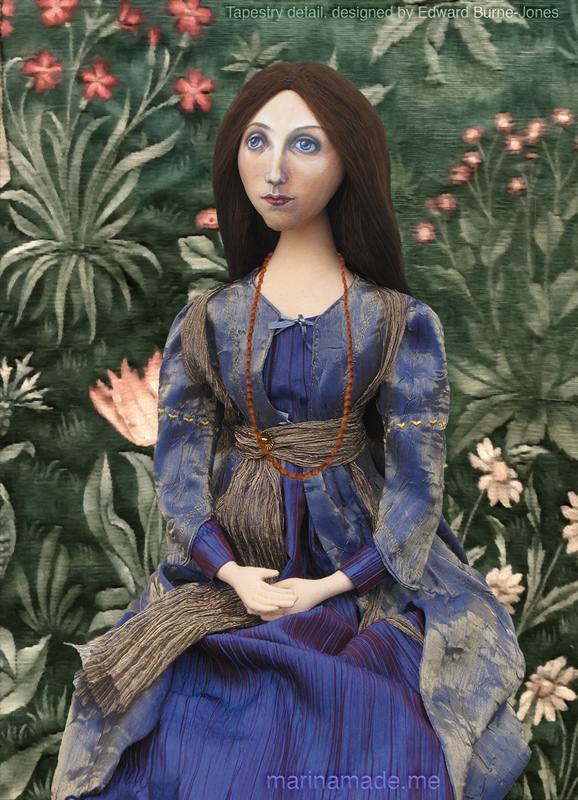 Gradually Georgiana became acquainted with artists of the Pre-Raphaelite circle, visiting the studio where Ned worked with Rossetti and Morris as well as meeting Ned’s idol, John Ruskin at the National Gallery. He was apparently delighted with her, calling her “a little country violet with blue eyes and long lashes”, this observation had little to do with any traits of Georgiana’s character, she had not yet grown into the impressive and formidable woman she would later become. 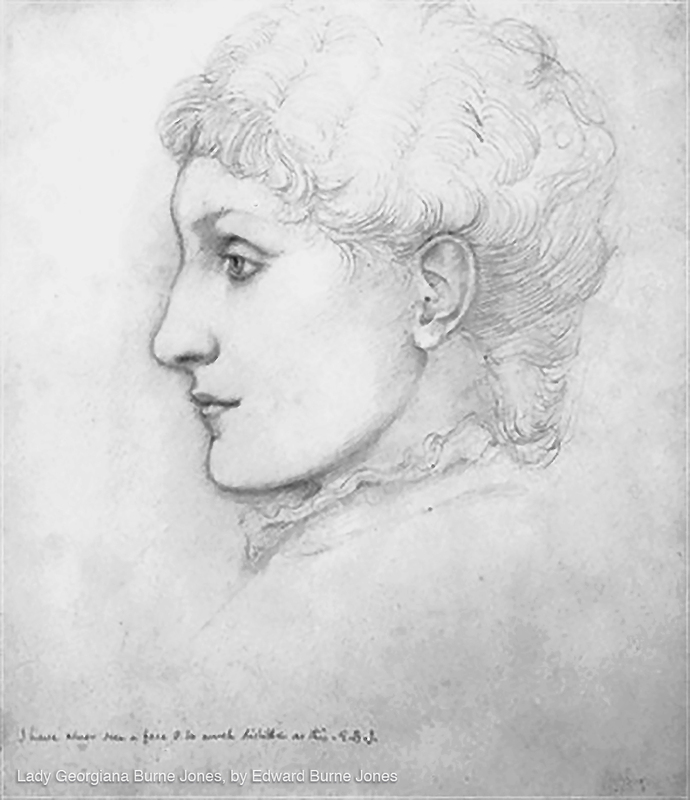 Pencil portrait of Georgiana Burne-Jones by Edward Burne-Jones. By 1859 Georgie had left the Government School of Design and was taking lessons with painter and friend Ford Madox Brown along with her sister Louisa. They worked on wood engravings, pen and ink and painting. Sadly few examples of her work remain today although her talent was encouraged and applauded by Ford Madox Brown. She herself was quite dismissive of her ability, maybe this was the affect of being surrounded by artists of exceptional brilliance. The early years of their marriage were blissfully happy. The couple spent the summer with their newly wedded friends William and Jane Morris at their recently built ‘Arts and Crafts’ home, the Red House in Bexley Heath. With their friends they combined days of working together on creative decorating projects on the Red house, with country walks and jovial soirées of discussion on the arts and crafts. Soon after the married couple visited various members of the family including Georgie’s married sisters, before eventually settling down into their rented rooms in Russell Place. Fortunately friends were generous with wedding presents and helped with items of furniture, as their first home was unfurnished and the pair were quite unprepared. For a while Georgie continued with her wood engraving and enjoyed the company and conversation she had with Ned and their artist friends. Ned was beginning to sell his work and was earning a small but reasonable income, he began signing himself ‘Edward Burne-Jones’. “Girl in a Green Dress”, 1860 by Edward Burne-Jones. Some experts believe this could be an early portrait of young Georgiana Macdonald. ‘Cinderella’, by Edward Burne-Jones, 1863. As Edward Burne-Jones became more successful they moved to Great Russell Street, opposite The British Museum. These new rooms were larger, Ned had his own room as a studio and there was a regular supply of water, making it feel more like a home. 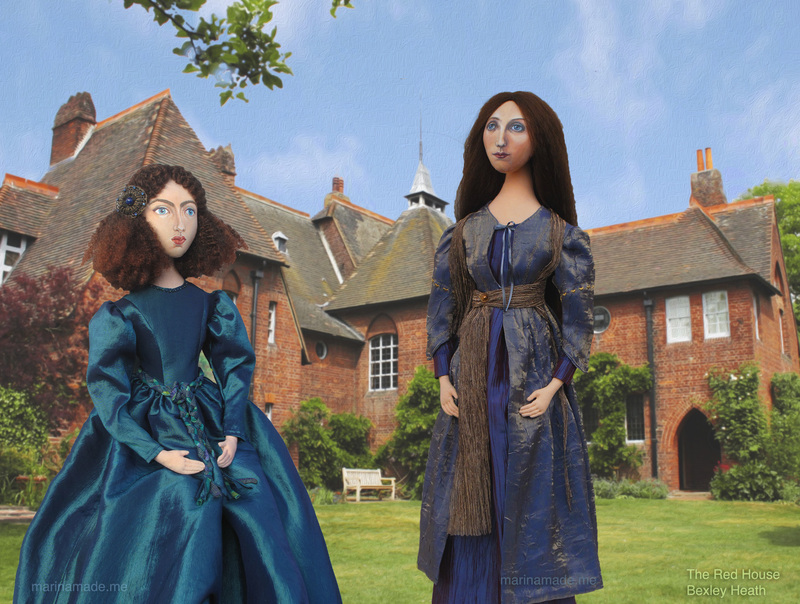 Morris and Jane, Rossetti and Lizzie Siddal were frequent guests at the little parties they held and their circle of friends became wider. 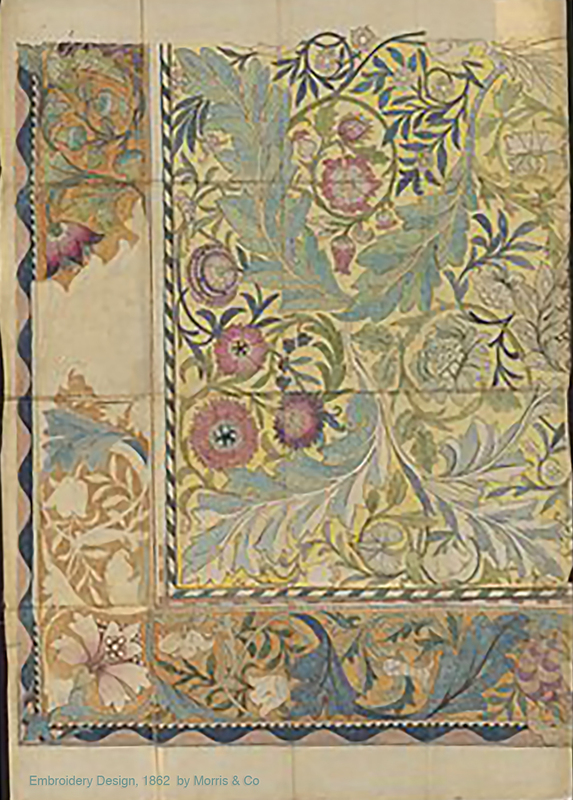 In January 1861 the decorative arts firm Morris, Marshall, Faulkner & Co. was jointly created by William Morris, Burne-Jones, Madox Brown, Rossetti, Charles Faulkner, Peter Marshall, and Philip Webb. Their aim was to design, create and sell medieval-inspired, handcrafted items for the home. These included paintings, furniture, carving, metal work, stained glass, soft furnishings and tiles. Jane Morris directed the embroidery section of the business and Georgiana was employed painting tiles. 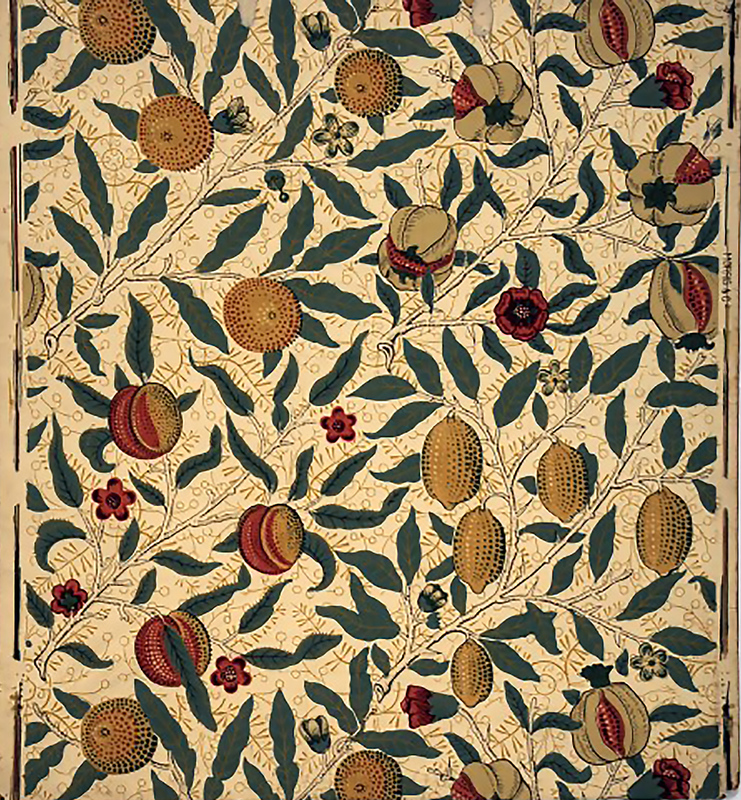 William Morris design, Pomegranate and Lemon wallpaper, produced by Morris & Co., and furnished the walls at their home Kensington Square. ‘Saint Cecilia’ stained glass designed by Edward Burne-Jones. 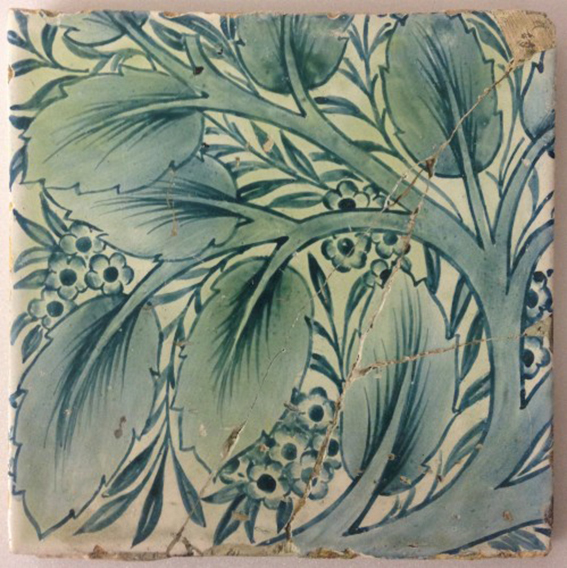 Hand painted tile in ‘Bay and Willow’ design from the Firm Morris & Co. Tiles like these would have been painted by Georgiana before she had baby, Philip. 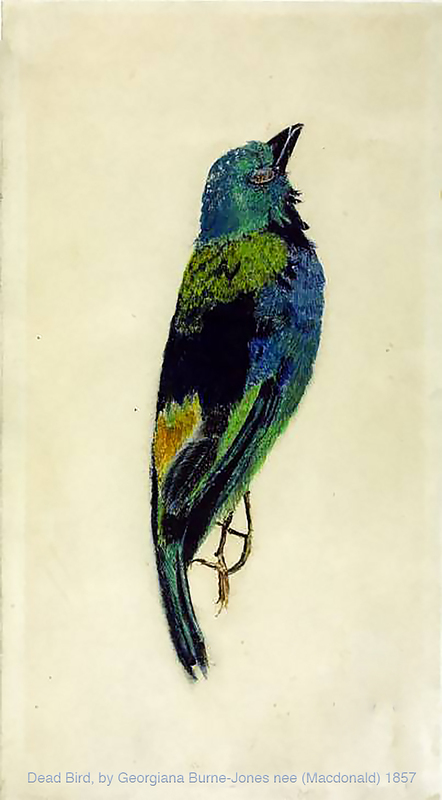 Embroidery design by Morris & Co.1862. Jane Morris managed the Embroidery department at this time. 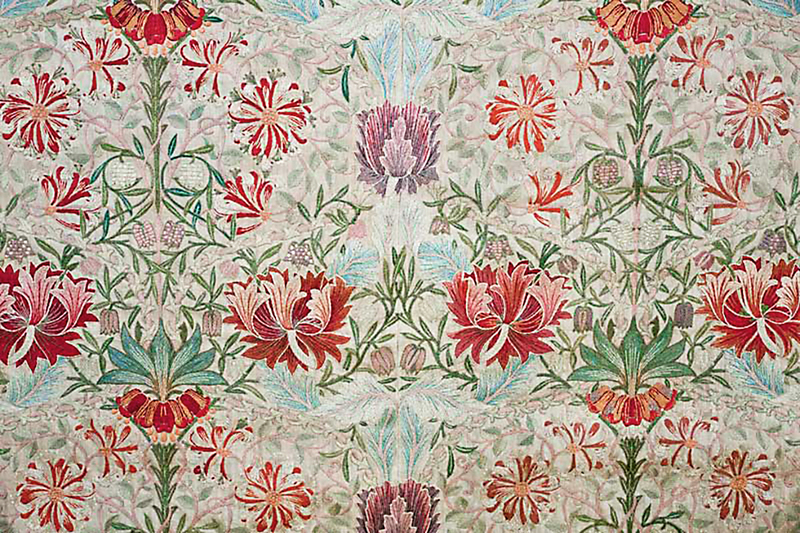 Honeysuckle, embroidered by Jane Morris, designed by William Morris. In October 1861 Georgiana gave birth to Philip Burne-Jones, there was only a midwife present and no complications. Despite the common recommendation from Mrs Beeton’s book to remain in a dark room with the baby for ten days, only a week after the birth Georgie took their baby to visit her aunt, then onto her parents for the christening three weeks later. However straightforward the birth was, Georgie found herself unprepared for the radical changes a new baby would bring to her life, both physically and mentally. 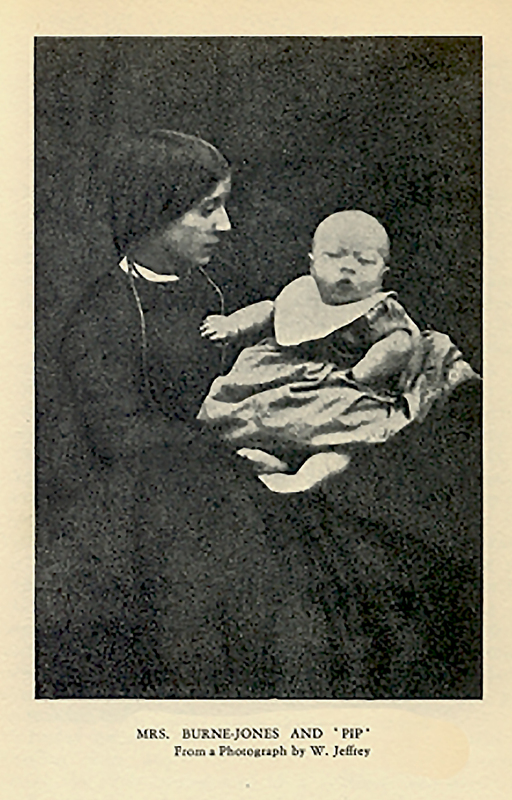 Georgiana Burne-Jones with her first child, “Pip”, photographed by W. Jeffrey. Georgiana Burne-Jones, Memorials, vol 1.pp. 235-6. Georgiana Burne-Jones, Memorials, vol 1.pp. 232-3. In the summer of 1864 young Phil caught scarlet fever, and Georgiana soon contracted the dreaded disease. At the time she was expecting their second child and the birth was brought on prematurely, leaving her weakened. The disease got worse and it seemed for a while she may die. The new baby named Christopher was also infected, he struggled for three weeks before he succumbed and died. Georgiana was ill for months and on her recovery she could not bear to return to their old home where so much tragedy had occurred. With the help of an old friend Ned found a house with a three year lease in Kensington Square. Georgie and Phil were with her family for Christmas and while they were away the house was decorated and all their belongings moved in ready for their return. It was a huge improvement, furnished with Sussex rush-seated chairs and pomegranate wallpapers from the Firm, it also had a garden. They were clearly moving up in the world; with a servant and a cook Georgie could now housekeep properly. Sibylla Delphica, by Edward Burne-Jones. Their daughter Margaret was born at Kensington Square in the summer of 1866, by which time they were settled and happy, but their lease was about to run out. Not wanting to move far from all their friends they agreed on the Grange in Fulham, a spacious 18th-century house set in a large garden. 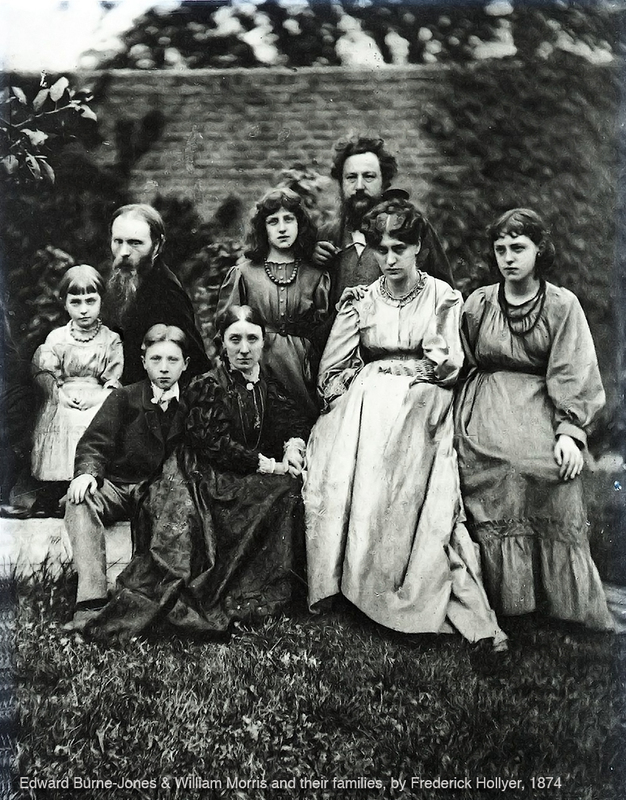 Edward Burne-Jones, William Morris and their families in 1874, photograph by Frederick Hollyer. 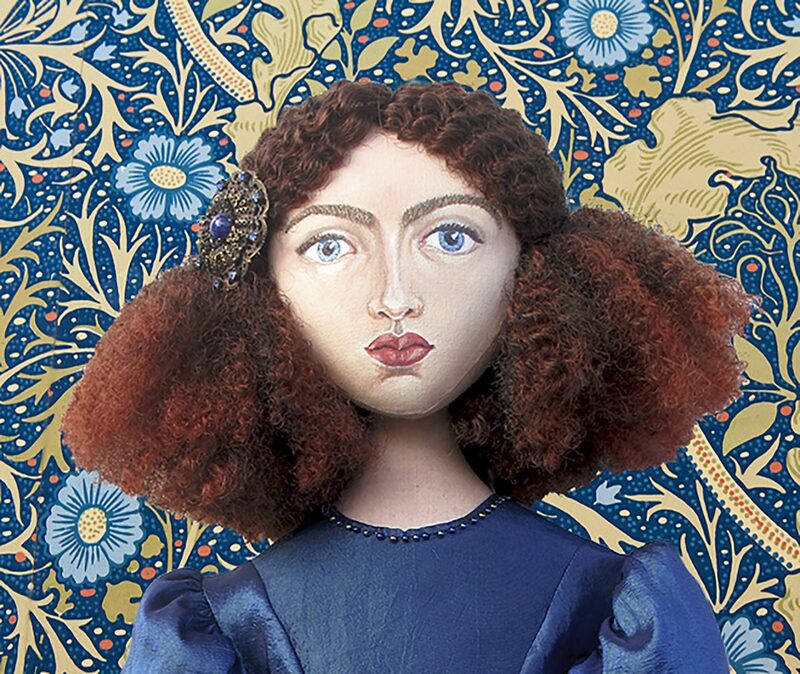 Sisterhood.Jane Morris. The size worried Ned, he thought it too grand, but Georgie knew that with her children, her friends, sisters and their children the Grange would make a fine home. It certainly must have been so, after it was decorated in showpiece style of Morris, Marshall, Faulkner & Co. 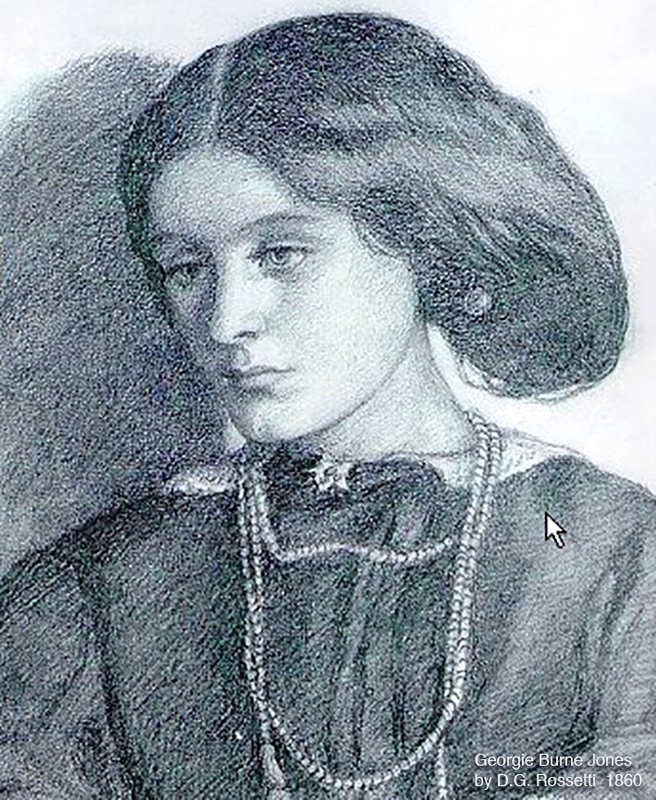 Drawing of Margaret as a young girl, by Edward Burne-Jones. Philip Burne-Jones aged about 17 by Edward Burne-Jones. By 1866 Georgie and Ned had been married for six years, the devotion and enchantment of their early days of marriage had been worn away by life’s struggles. The Grange and two new studios gave Ned more freedom, as well as privacy. 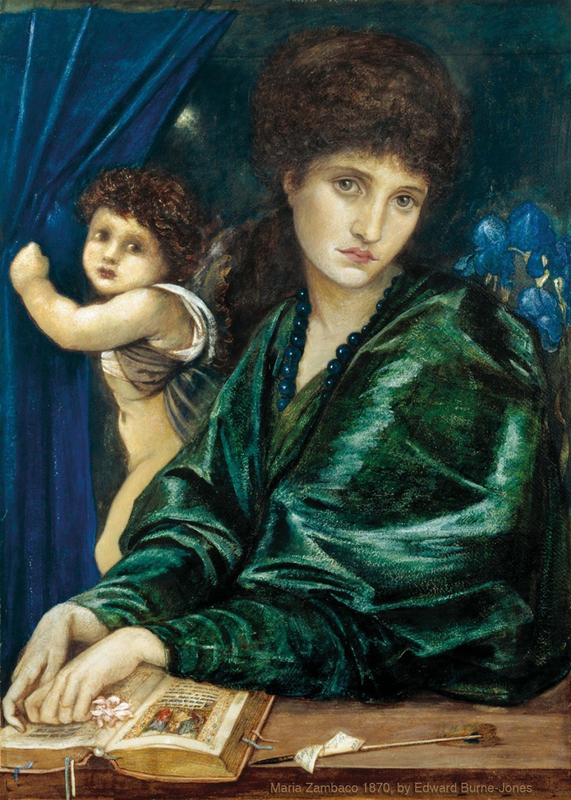 In 1866 Euphrosyne Cassavetti, a formidable Greek heiress known by her family as “the duchess”, commissioned Burne-Jones to paint her daughter, Maria Zambaco, in ‘Cupid and Psyche’. Maria Zambaco in ‘Cupid and Psyche’ 1870, by Edward Burne-Jones. This was commissioned by Maria’s mother, Euphrosyne Cassavetti. 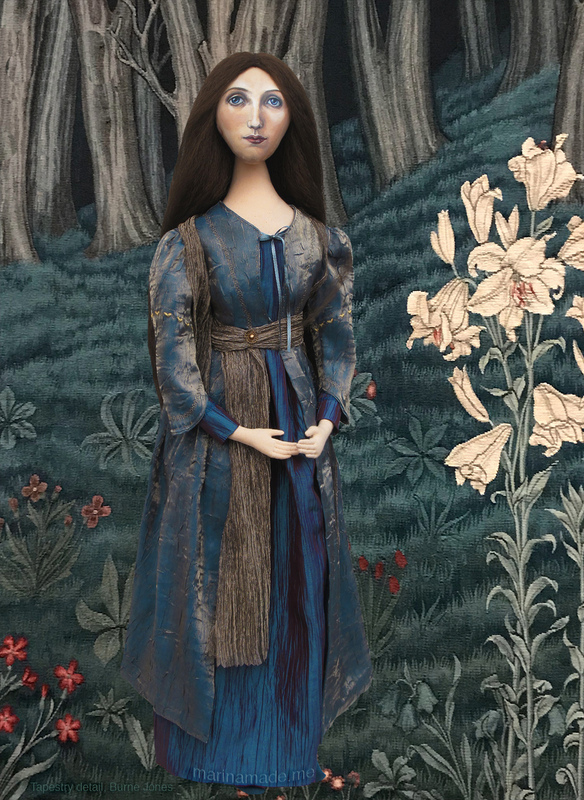 The beautiful and fiery Maria was considered more forward and direct than reasonably acceptable for women in Victorian Britain, but her allure soon had Burne-Jones infatuated. They began a secret passionate and ultimately disastrous affair, which lasted until 1869. It appeared that Georgiana knew nothing about it, perhaps it was her not wanting to know, however she was aware that Mrs Zambaco was a frequent visitor to the Grange studio either as model or pupil. Finally in June 1868 Georgiana found a letter from Maria in her husband’s pocket while doing the laundry. It was clear that the two of them were lovers, but Ned desperately pretended that nothing was happening. Georgiana went to stay with her mother for several weeks and her sisters rallied round, while Georgie remained stoic and occupied herself with household duties. On her return nothing was resolved, Burne-Jones did not want to leave Georgie, but neither did he want to leave his mistress. Maria wanted Burne-Jones to run away with her to live on a Greek Island, and when he refused, she presented a large bottle of Laudanum which she threatened to drink. A struggle then ensued, picture the scene: the by now hysterical Maria, attempting to commit suicide by throwing herself off the bridge into Regent’s Canal, Ned forcing himself upon the woman to stop her, then the police arriving and apprehending Ned; It would have appeared almost farcical. 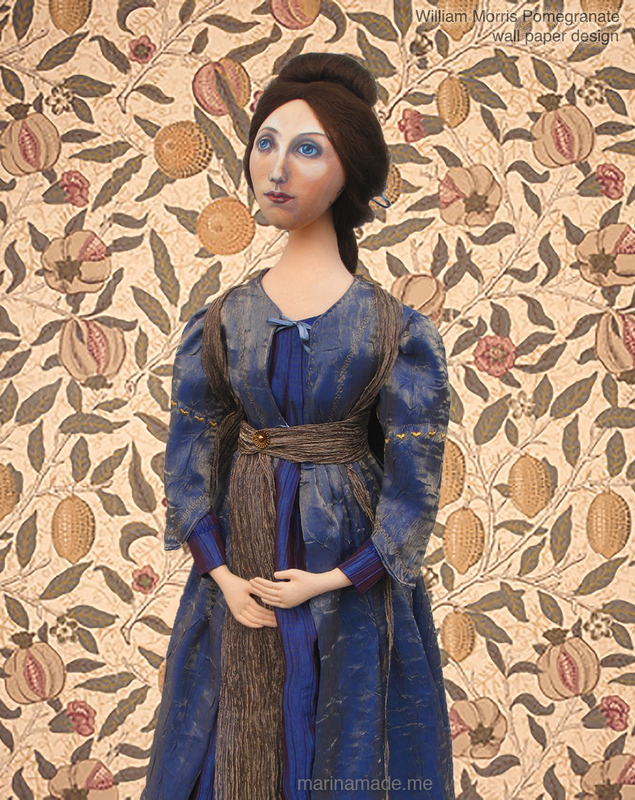 After a failed trip to Italy to escape from his troubles with William Morris, he returned home, where Georgiana, who had told nobody of his return, tried to continue as normal, fending off all visitors. Ned didn’t exhibit for much of the 1870s. Georgie’s friends were naturally concerned about her, but she was determined to keep her torment to herself. Finally she could bear it no more and took the children to lodgings in Oxford, telling Burne-Jones they’d be away for a month and she would take stock of her life. She decided that if Ned was prepared to try again, so was she. Confiding in a letter to a friend she wrote, “I know one thing, and that is that there is love enough between Edward and me to last out a long life, if it is given us”. Georgiana Burne-Jones to Rosalind Howard, n.d CH, J22/27. 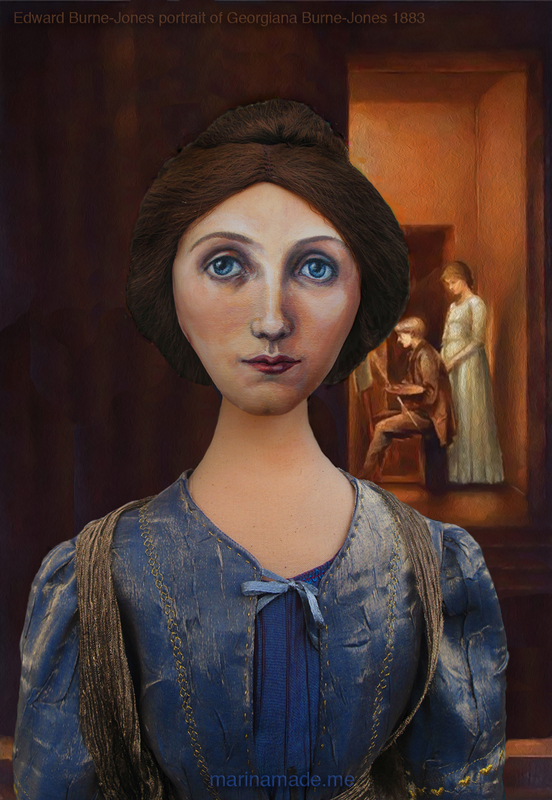 On Georgie’s return to the Grange Burne-Jones decided to stay and life together continued, but the stability and equilibrium that she experienced earlier in her marriage was never recovered. 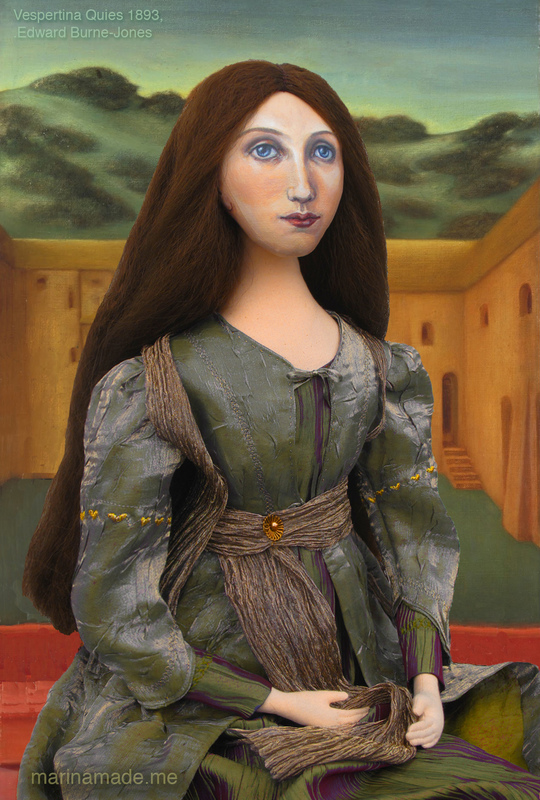 Ned continued to paint Maria Zambaco, but Georgie’s eyes were now open. 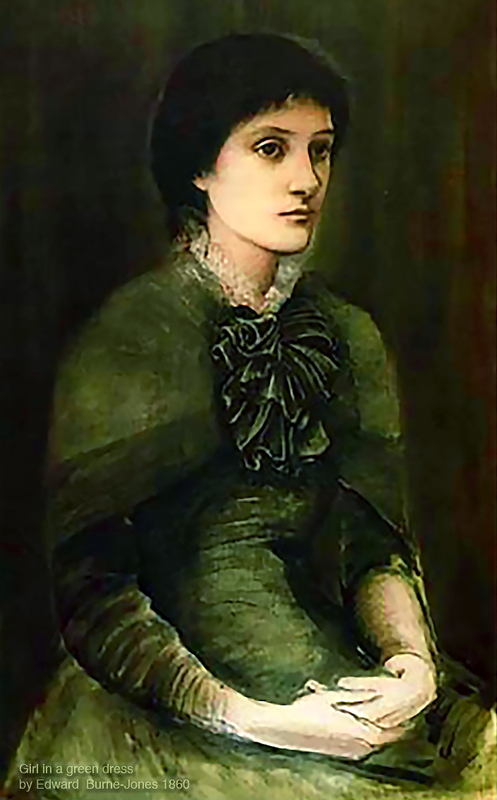 During these difficult years Georgiana developed a close friendship with William Morris, whose own wife Jane had fallen in love with Rossetti. Morris and Georgie may have been in love, but she would not have left her husband for him. As it was the Burne-Joneses remained together for thirty more years and the Morrises stayed married; however Georgiana and William Morris were close for the rest of their lives. 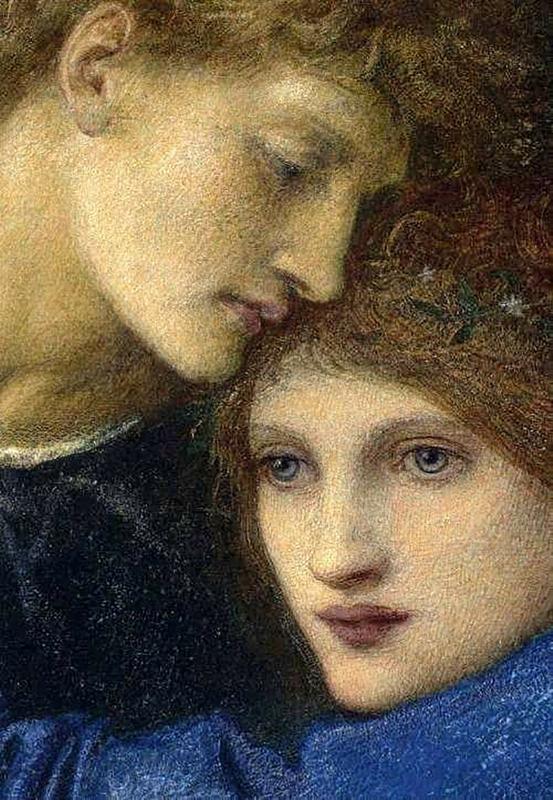 Burne-Jones observed his good friend and his wife together fondly, curiously blind to their deep rooted love for one another. 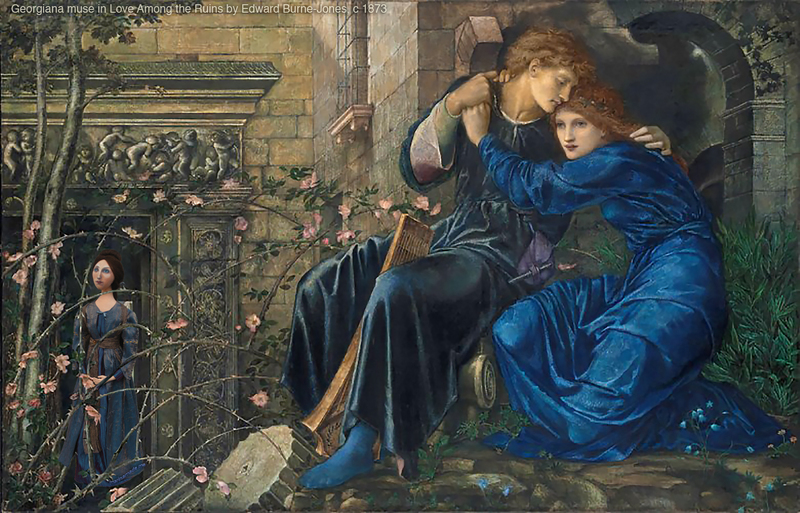 Georgiana muse set in, “Love Among The Ruins”, by Edward Burne-Jones, 1873. In 1880 the Burne-Jones family bought Prospect house in Rottingdean near Brighton in Sussex. It marked a new chapter in their life allowing them to leave the tribulations and disturbances of London behind. The couple later acquired the cottage next door, merging the properties to create ‘North End House’ and building a studio for Ned. Georgiana loved her new country house and garden, and became active in village affairs. Rottingdean became her home in way that it never would be for Ned, who preferred the Grange and its studio in Fulham. He had become depressed after his good friend and mentor, Dante Gabriel Rossetti died on Easter Sunday 1882. Also Ned’s friendship with Morris was waining since he left the firm Morris & Co. and their increasing opposing views on Socialism divided them. Edward Burne-Jones and William Morris, photograph by Frederick Hollyer in 1868. Now he had a Baronetcy to explain away to his friends. 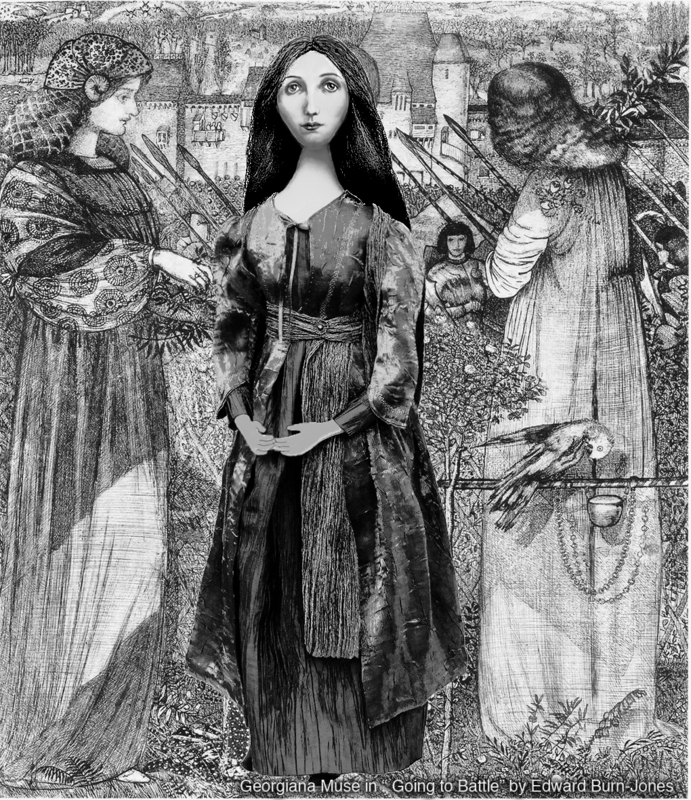 Most of his Socialist circle were appalled including Morris and Georgiana herself, who was now to be Lady Burne-Jones. “Pan and Psyche”, 1874, by Edward Burne-Jones. Georgiana had ongoing projects in London that she and several of her friends were involved in, one of which was the ‘South London Fine Art Gallery’ in Camberwell. Its aim was to bring art education to the working-classes. Along with Walter Crane, Leighton, Bayliss, G.F. Watts and his wife Mary, Georgiana organised the loan of paintings from her husband, friends and patrons to set up the Gallery. It became too radical for Burne Jones so he withdrew from the committee, but Crane and Georgie completed the project, adding a library and later developing an Arts and Crafts school. Rural living suited Georgiana, she was leading a much more active life. She ran as an independent for Rottingdean Parish council in 1894 and was elected in 1895 much to the delight of William Morris and Ned. She worked to support the interests of the working class and women’s issues, taking positions that were radical for the wife of a baronet and new and bemusing to the villagers. 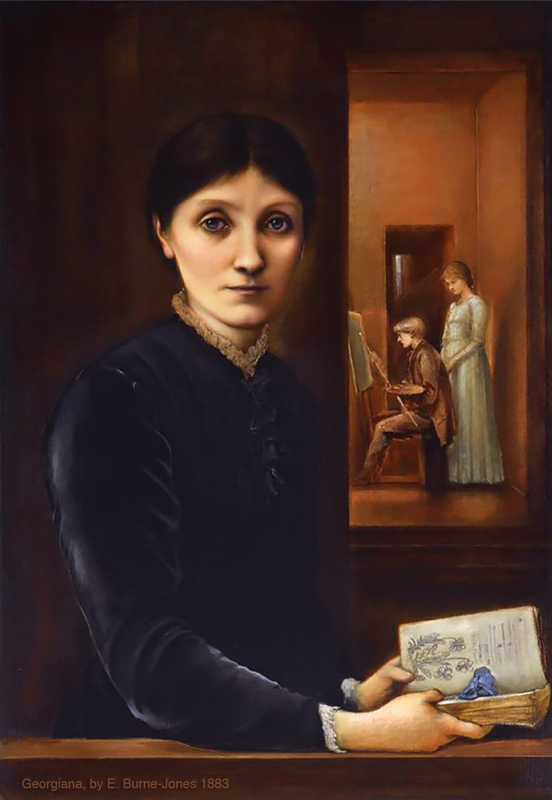 However Lady Burne-Jones’ day to day work in the parish focused on worthy and practical matters like street lighting, recruiting a village nurse and a fire brigade for the community. Georgiana was as the only woman member and served on Rottingdean council until 1901. In 1896 William Morris died after a long lingering illness. The news devastated Ned, who had been Morris’ friend and partner since early college days. Georgiana too would have been grief stricken after losing such a genuine, faithful friend, but she remained stoic and went to comfort May and Jenny, William’s daughters. 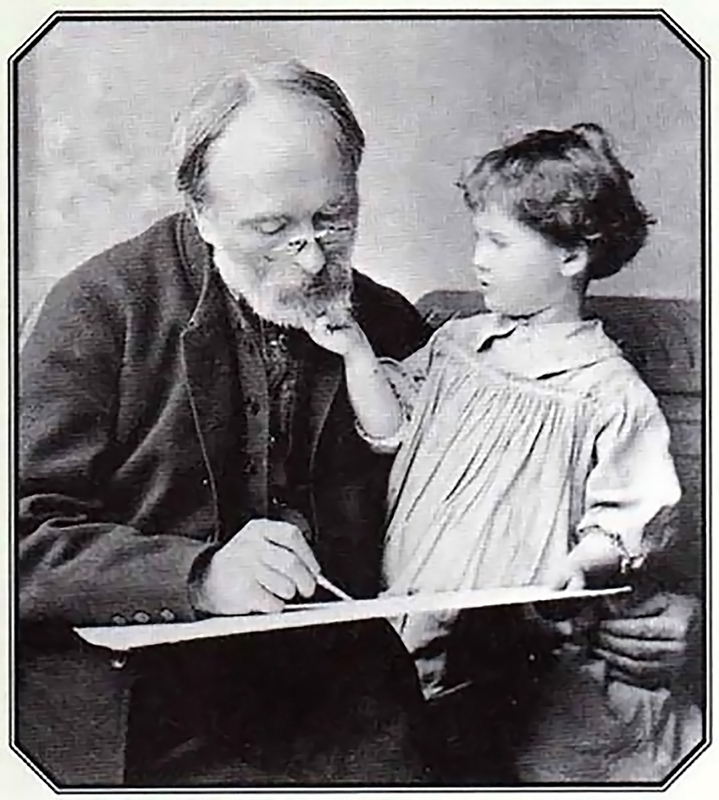 Edward Burne-Jones with his granddaughter Angela. 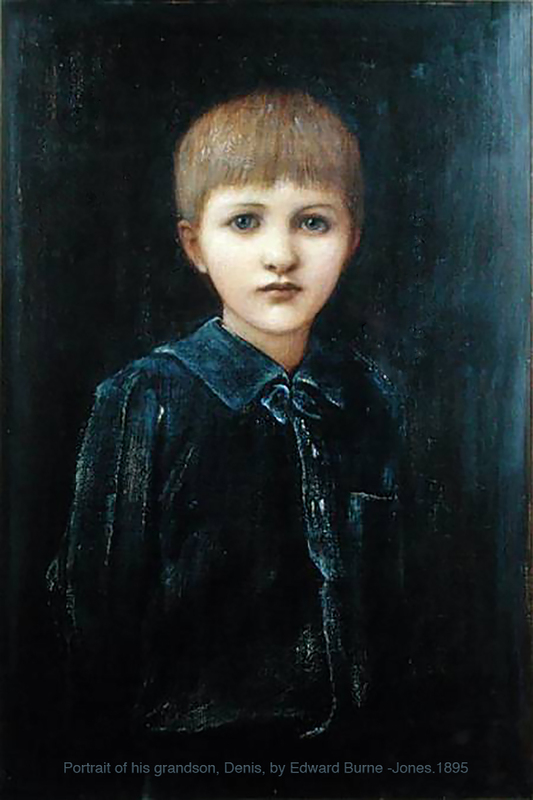 Portrait of Denis Mackail, grandson of the artist, by Burne-Jones. 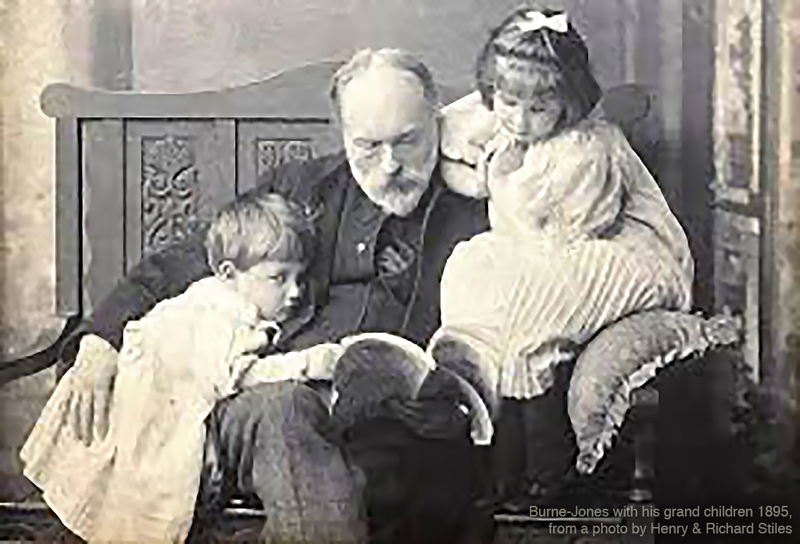 Edward Burne-Jones with is grandchildren, Denis and Angela, from a photo by Henry and Richard Stiles, 1895. 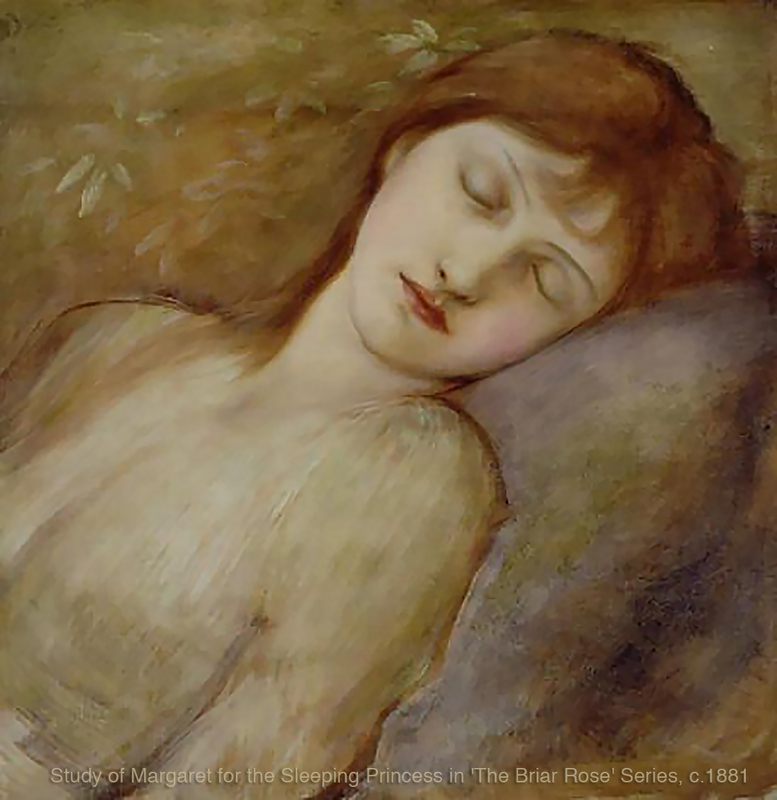 Margaret as sleeping beauty, study for “The Briar Rose” series, 1881 by Edward Burne-Jones. Desolate and unable to work Ned became ill, his respite was their daughter Margaret and the grandchildren, Angela, Denis whom he loved dearly. In June 1898 Ned died in Georgiana’s arms before the doctor could come to him. A month or so before he died Georgiana showed him a piece she’d been writing towards a novel. He admired it and encouraged her to write more. Having dreaded the thought that someone unsympathetic or indifferent might attempt to write his biography, he asked Georgiana to write his memoirs. It is conceivable that he was afraid of candid revelations potentially damaging his reputation and his family’s future. 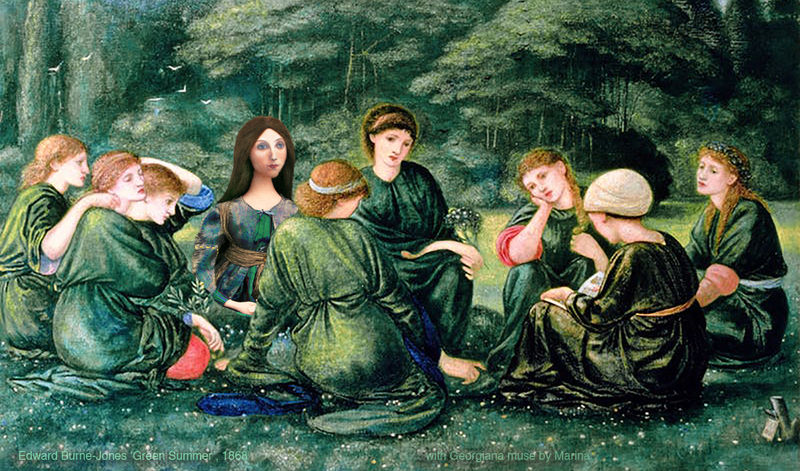 Georgiana began the task before Ned’s death, revelling in memories of those early years of artistic enthusiasm. She resigned herself to Ned’s death and busied herself with determined effort on her husband’s memoirs. Rarely open to women at that time this was an opportunity and undertaking Georgiana found fulfilling and rewarding. It was a project that would be published six years later. Portrait of Georgiana Burne-Jones photographed by Frederick Hollyer, 1882. Now on her own Georgiana kept busier than ever, along side her writing she kept politically active and promoted causes she believed in, including protesting against the Boer war and opposing Britain’s action in South Africa.This was in contrast to the general view. Her nephew Rudyard Kipling persuaded her to remove a banner she’d hung from her windows which read: “ We have killed and also taken possession”. He was understandably concerned that his aunt would fall victim to outraged villagers. n 1904 two volumes of Memorials by Georgiana Burne-Jones were published, still remaining a valuable source of reference today. Consistent with the values of the times most of the eccentricities and scandal of Burne-Jones personal life were glossed over. 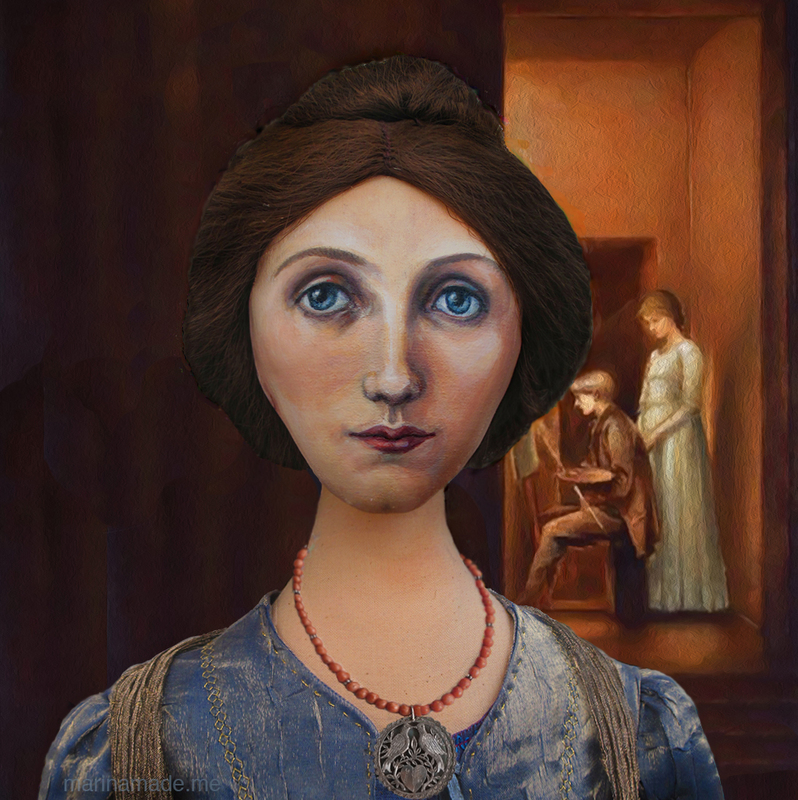 Georgiana remained faithful to her husband’s memory. 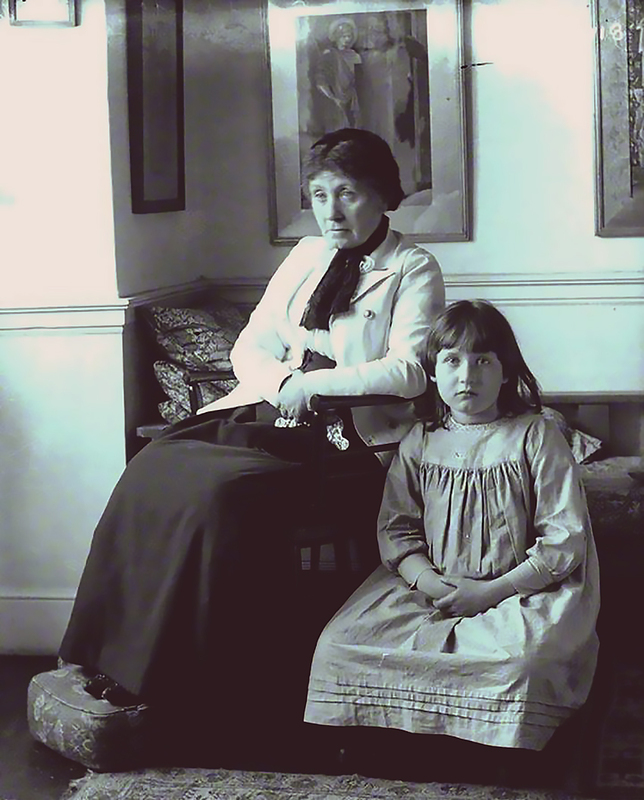 Georgiana Burne-Jones with her granddaughter, Angela Thirkell, 1895. Georgiana died aged 80 in 1920. Her strength, calm presence and stable nature enabled Ned to work; allowing for his quirks of fantasy and accepting his infidelities by remaining by his side, enabled him success. 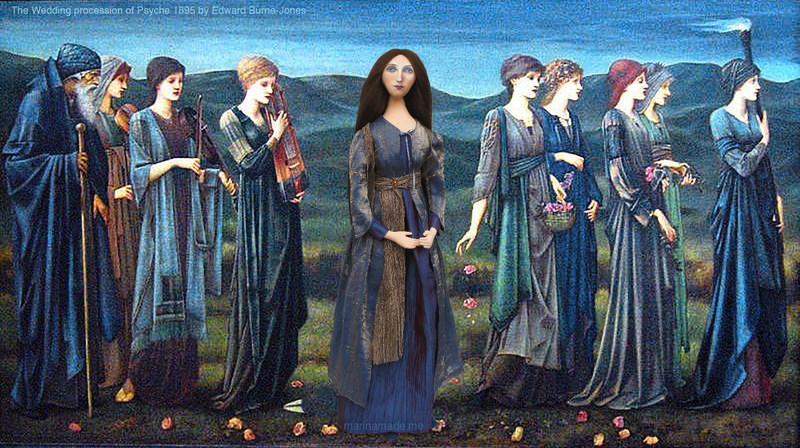 Honouring his wish by remaining true to him in her memoirs, endorsed Burne-Jones life and art. 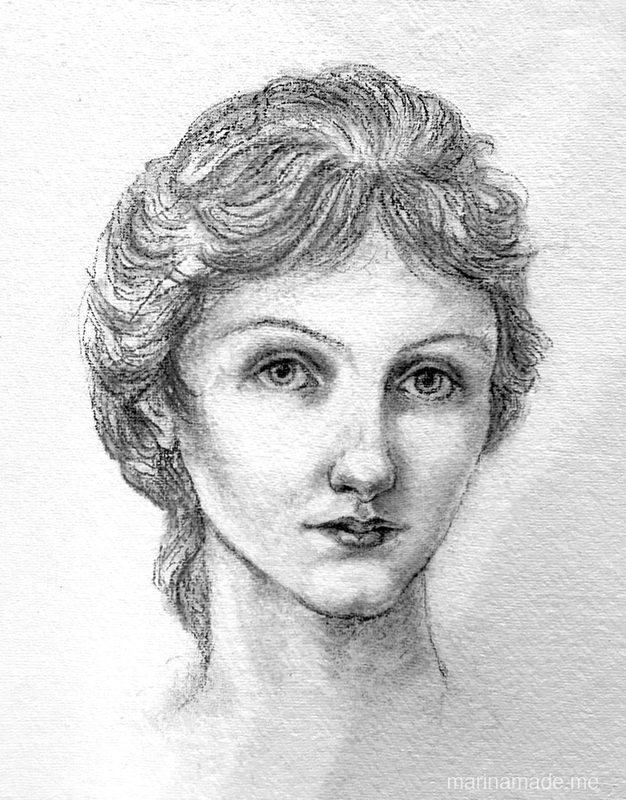 Georgiana Burne-Jones muse head with features sketched. Georgiana muse, face under painted. 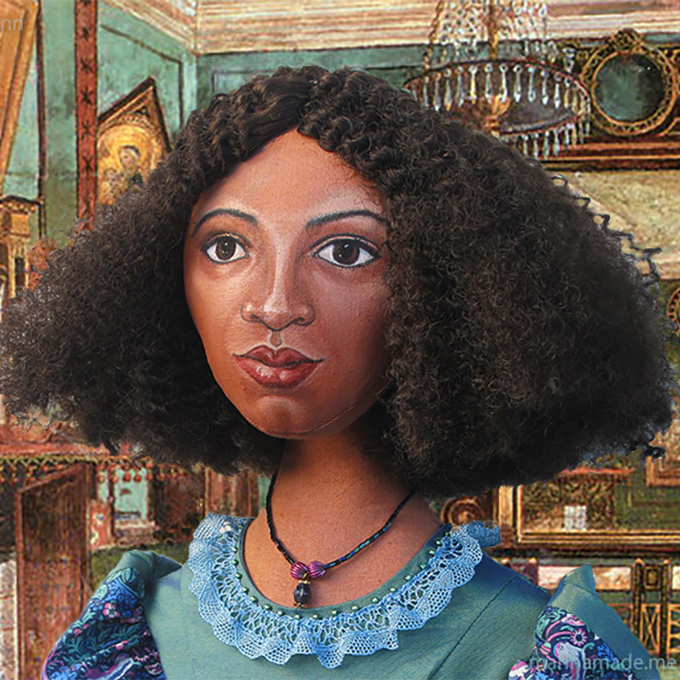 Detail of Georgiana’s dress and tunic on muse by Marina Elphick. Modelling and painting Georgiana’s head and detail of hands. A Circle of Sisters, by Judith Flanders, Penguin Group. By Stephen Wildman and Stephen Christian. 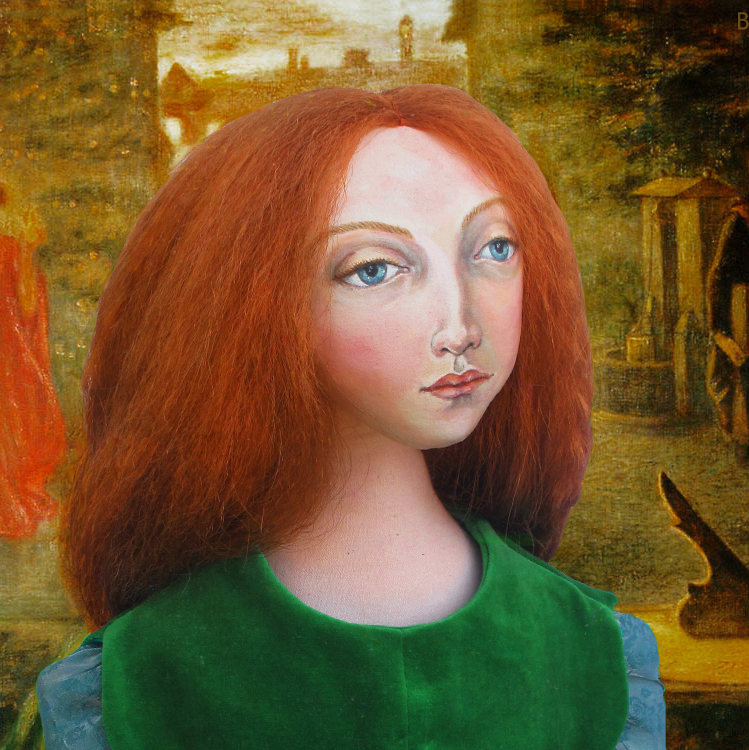 Pre-Raphaelite Girl Gang, by Kirsty Stonell Walker, Unicorn. 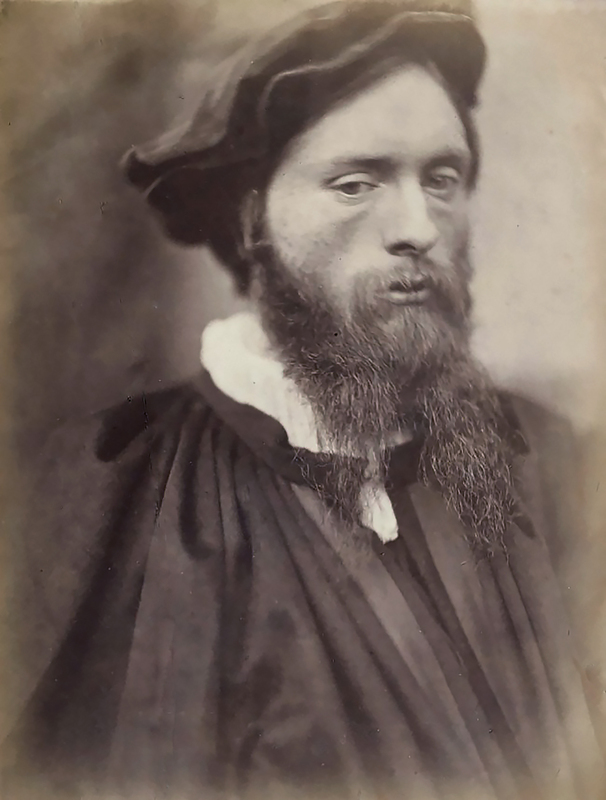 Dante Gabriel Rossetti, Alicia Craig Faxon, Phaidon Press, Oxford.